With almost a decade’s worth of aquarium design, filtering technique and fish tank science under their belts, Eric Suen and Kevin Liang, co-founders of Aqua Design Innovations, feel confident they have the experience, knowledge and vision to offer a sustainable aquarium that utilizes aquaponic growing techniques at an affordable price. Their product, the EcoQube, is a desktop-size, self-regulating aquaponic ecosystem complete with plants, fish, and lighting. The pair launched a Kickstarter campaign on Nov. 30, 2013, hoping to raise $39,000 by Jan. 12, 2014. If funded, the money will enable the company to start production. Suen and Liang are third-year students at University of California, San Diego. Suen is studying economics while Liang studies biology. The pair formed Aqua Design Innovations when they were still in high school as an aquarium consultancy. Back then, the two aquarium enthusiasts spent their spare time acquiring as much knowledge as possible about the gentle art of tank life, working in various aquarium shops and learning about sustainable fish-breeding techniques and aquatic systems. EcoQube is Aqua Design Innovations’ first transition from consultation and fish breeding into sustainable product development. The EcoQube is a traditional-style fish tank with an aquaponics-based filtering system that supports fish life within the tank while allowing for plant growth on the outside of the tank. 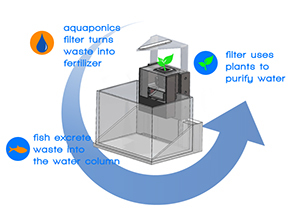 The aquaponic filter transforms fish waste into nutrients for the plant, naturally cleaning the water while feeding the plant. “The filter is built around the plant to push the water through the plant roots,” explains Suen. Great for growing flowers and herbs, the EcoQube offers a glimpse at the underwater world as well as into an emerging technology behind the sustainable farming movement. Originally, Aqua Design Innovations intended to patent an aquaponic aquarium filter and offer it for retail, but after looking into sustainable packaging, Suen and Liang felt it made sense to offer the tank as part of the kit and use it as the packaging for the filter. Comparable with current aquarium kits on the market, the EcoQube filter is expected to cost around $60. With the tank and light, Aqua Design Innovations anticipates a retail price around the $120 range. Prototypes of the EcoQube have gone more than a year without needing a filter change, according to Suen. No chemicals are involved in the system; the only maintenance required is an occasional topping-up of tank water. The system works with tropical, fresh and salt-water fish and terrestrial plant life. A goal of Aqua Design Innovations is to use the EcoQube concept to increase awareness of aquaponic technology by introducing the filtering technique into classrooms, offices and homes. The firm is already taking steps to develop a school curriculum as a supplement to the aquarium kit, in partnership with the nonprofit company Eco Life Foundation. With so many aquaponics enthusiasts focusing on the larger commercial farming market, Suen feels that the EcoQube is well positioned to be a leader in the emerging non-commercial aquaponics market. “We see the EcoQube as a platform to really spread the word about aquaponics; what it is and how it works,” says Suen.